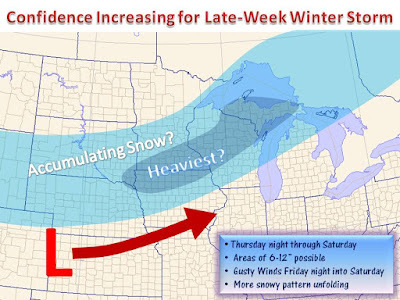 After a stretch of 5-8 days of well above normal temperatures and widespread record highs, confidence is increasing in a large winter storm come Friday. Computer models have latched on to this idea for several days and the question of "If" is becoming more of a "Where and When." Being 5 days out the exact location and amounts are unclear, but it is starting to look like an axis from northern Iowa through northern Wisconsin has the best shot for 6"+ of snow. An upper level trough is expected to swing into the northern Plains late week, allowing for the ushering in of colder air from the north. The anticipated storm system will track along this boundary of cold to warmer air, taking it into the Midwest by Friday. Furthermore, a deepening of the low pressure and a high pressure to the north and west will act to increase winds on the back side of the system Friday night into Saturday. It is not impossible for some locations to reach blizzard criteria Friday night. Lots to work out in the next few days, feel free to follow on Twitter and 'like' on Facebook for more frequent updates. We are also likely headed into a more active wintry pattern, with a couple chances for larger winter storms through early March, stay tuned! Here is one model's take on the coming storm. Powered by Pivotal Weather.